Using everything they learned at a regular season KVAC meet at Cony on September 22nd, the Hampden Academy Broncos stormed the hilly course at Cony to take the Class A team title from Bangor. Hampden ended with 52 points while Bangor took second with 76 points. Green Bridge rivals Mt. Ararat and Brunswick took the third and fourth spots with the Eagles collecting 96 points to nip Brunswick which finished with an even 100. Thirteen Class A schools put the necessary five runners across the line to be considered for the team title. Hampden won the nine team meet on September 22nd with an average time of 19:08 but the Broncos smoked the course today averaging over a minute faster at 18:03. First across the line for the champions was Wyatt Lord who finished 3rd overall. The Bronocs' other scorers--Grahme Sokoloski, Connor Glowa, Jason Mathies, and Lucas Hale--went 3, 5, 6, 8, & 30. 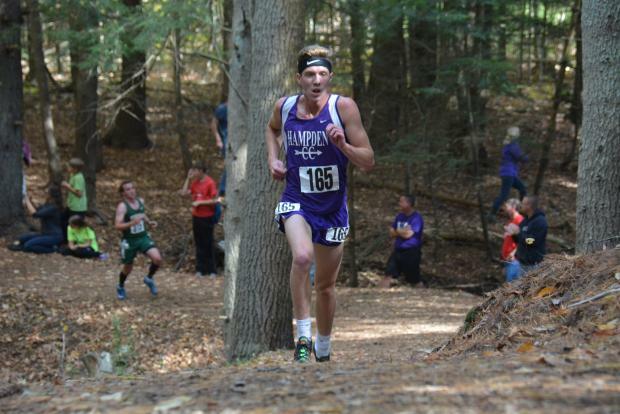 As expected all seven of the Hampden varsity runners cut their times since they last ran at Cony, but freshman Connor Glowa crossed the line at 18:11, more than two and a half minutes faster than his time three weeks ago. Lord was expected to challenge Bangor's Gabe Coffey, and Lisandro Berry-Gaviria of Mt. 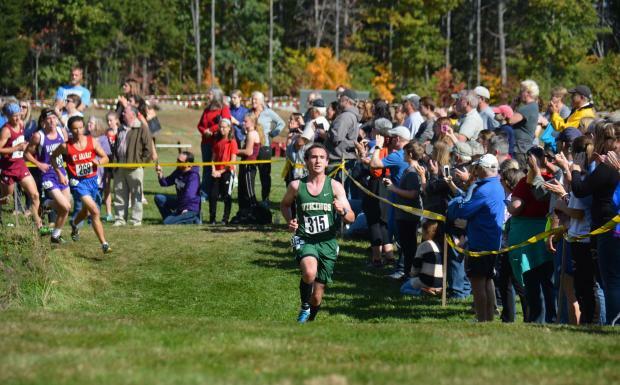 Ararat for the individual title, but it turned out to be a four way race for the front spot as Oxford Hills' Dominic Sclafani led for much of the first loop of the course. The course itself begins on a practice field behind the high school and winds its way through a field surrounding retention ponds before plunging into a wooded conservation area, the Augusta Nature Education Center, maintained by the City of Augusta. The course makes one loop around the inner "jayvee loop" and then ascends "the Mountain loop" a long and steep hill with (if Garmin is accurate) a total elevation gain of 106 feet. It's a challenging course and most spectators, if they see any of the wooded portion at all, catch pieces of the inner loop and get two views of the runners in the rolling gullies. But a lot can change out on the mountain. And when the pack returned to the inner loop for the second pass over the final mile Berry-Gaviria, Coffey, Lord and Sclafani were comfortably spread out in the one through four positions where they would finish. Berry Gaviria's winning 2017 time of 17:05 was a shade slower than his 16:59 in 2016 which had netted him 5th place. 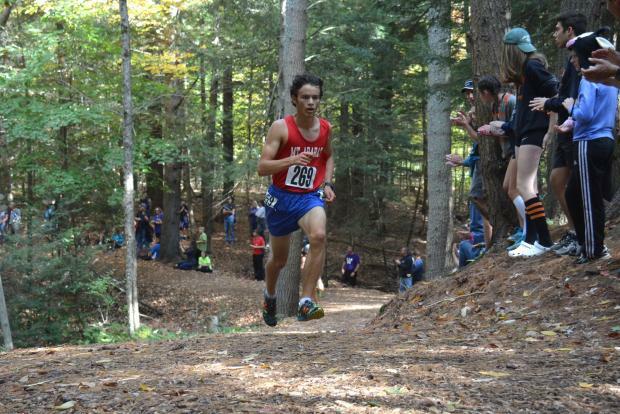 Coffey finished at 17:16 and Lord at 17:37 all three were "First Team KVAC" (top 7) last season. Sclafani's 4th place finish at 17:52 was a leap forward as he had finished 19th in 2016. Joining these four as first team all-conference were 5th and 6th place finishers Sokoloski and Glowa of Hampden. Taking the 7th spot was Caleb Richardson of the host, Cony. The second team all conference award winners were 8th place Jason Mathies of Hampden, Russell Allen of Edward Little in 9th, Andrew Chingos of Brunswick took 10th, 11th went to Gordon Doore of Bangor, 12th to Brunswick's Cam Ashby, Devin Hoskins of Mt. Ararat took 13th, and the final all conference spot went to Mt. Blue's Zeke Robinson. Next week, these thirteen teams will run all run together again at the Northern Maine Regional meet at Belfast's Troy Howard Middle School. There are no other Class A Schools from further north so the KVAC Class A Championship and the Northern Maine Class A Regional meet feature the exact same teams. Expect the result to remain the same? It's a much different course and times should be substantially faster. One the boys side over the past three seasons the KVAC Champion and runner-up have repeated themselves in the Northern Maine Regional. In 2015 in the KVAC girls Championship Mt. Blue edged Brunswick by a single point to take the conference title but the Dragons came back the following week to win the Northern Regional by 27 points. 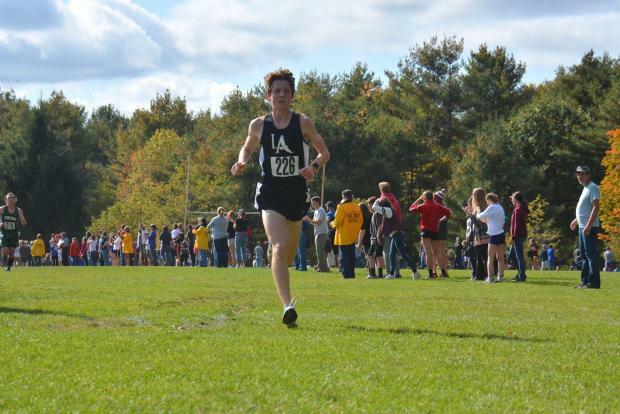 One team---Lincoln Academy---looked to have a clear path to the KVAC Boys Class B title prior to the meet Saturday October 14th. And the Eagles resoundingly confirmed the prediction as they put all five of their scorers in the top ten to repeat as KVAC Champions for Class B. Led by junior Sam Russ, who took the individual championship with a time of 17:44, a bit better than his 2016 time of 17:51 when he was KVAC runner-up, the Eagles were deep enough that their 6th place finisher, senior Levi McAtee claimed a spot in the KVAC all conference second team by finishing 14th overall. Lincoln's scorers finished 1, 3, 4, 5, and 8. Joining Russ in the scoring were Jarret Gulden, Benji Pugh, David Barnum, and Noah Jordan. Waterville's Nick Dall, the 2016 title holder, interrupted the Eagle's streak by claiming the 2nd spot with a time of 17:52. Maranacook's Luke Bartol took the 6th spot while Dall's Waterville teammate Soren Nyhus claimed the 7th spot and the final position on the KVAC All Conference first team. The second 7 finisher made up the second team all KVAC team and included Noah Jordan from Lincoln Academy (8th), Osiris Marable from Erskine (9th), Ricky Smith of Belfast (10th), Connor Freeman (11th) of Morse, Brendan Moline (12th), and Eamon Goscinski (13th) of Belfast along with Levi McAtee (14th) of Lincoln Academy. In the team competition Lincoln Academy had 21 points and were followed by Maranacook (93) just squeaking by Waterville (94) for the last team award. In all nine teams put the necessary five runners across the line to be considered for team scoring. Next week, some of these teams will head south for the Southern Maine Regional Championships at Twin Brook, while others head North to Belfast.